What a day I had yesterday…all filled with GREAT surprises! I now know all of my friends here at Lane’s End had a wonderful surprise planned for me…and they filled TEAM ZENYATTA in on it! For days, as you know, I have been walking around in my new paddock. The Farm wanted me to be totally familiar with every inch of the area. This is all part of my ‘baby steps’ process. Each day, I was given a bit more space to investigate and explore with Charles, Donna and the crew here! They ultimately had me on a very loose hold during these adventures. I was also given ample time to look at all of my beautiful surroundings and thoroughly relax and enjoy my time outdoors. After several days of this, the FARM felt I was totally comfortable with my new paddock. A plan was then developed to establish the day when I could be ‘on my own’ outside. It was organized for this to take place YESTERDAY. TEAM ZENYATTA WAS PART OF THE PLAN…and they flew into Lexington TO SHARE THIS MOMENT WITH ME! As I was being prepared for my morning ‘walk’, David and Mike picked up Team Z at the airport. SURPRISE! Within minutes, they were all right here with me at my Lane’s End Barn! SUCH FUN! (Carrots and mints for EVERYBODY!) Yippee! Barbara Livingston, from DRF, and Anne M. Eberhardt and Alex, from THE BLOODHORSE, were also on hand. Sweetly, ANN MOSS was going to take some of her own videos…….and MY DEAR JOHN brought his new camera to add to the fun! When I was ready, we all walked out to my paddock together. It was crisp…but not as cold as the last time they were here. For quite a bit of time, I walked around with Charles. We wanted to show everyone how well I handled this. We walked all over this large paddock…and I checked out everything….just like I have been doing for days now. Ann, Jerry, John, Dottie, Mario and Carmen…all thought I was doing very well. I was really feeling very confident in this space and with the footing. Then, suddenly, (and to my surprise…and delight) Charles took the shank off me. I was allowed to be ‘ON MY OWN’. Lane’s End positioned many people from their staff all over the perimeters of the paddock area as they wanted to be sure I was very logical and safe at this moment. GUESS WHAT???? I WAS! At first, I just played around with some alfalfa they had carefully positioned in 2 places in the center area of the paddock. I moved from one patch of this to another…walking and grazing. Then I thought…Hmmmm…this is different! I don’t really have anyone right next to me. Suddenly I looked up and saw so many of my friends all standing several feet away. At that moment, I noticed Mario. I walked over to him and stood there. He hugged me and scratched my neck like he has done for YEARS! It was so special! I walked over to the Moss’. Ann and Jerry both hugged me and gave me some great treats from home. Then I looked at my dear JOHN…and walked over to him. He gave me several loving pats and then looked down and ‘checked my legs’. (Old habits just don’t go away. This is a TRAINER kinda’ thing. John has checked my legs every single morning for over 4 1/2 years. It was like great old times!) For several minutes more, I was able to walk around and greet all of my other friends. THIS WAS REALLY GOING WELL! Now…I thought…HMMM! Let’s see what happens when I walk farther out to the other part of the paddock. So I did. I walked around looking at everything. I was careful..and enjoyed this. I WAS ALL BY MYSELF! I stood at one edge of the paddock just staring over the fence. 2 squirrels were playing in the tree…and I just loved watching them. I walked over to see the geese playing in the pond. I then went to greet all of my Lane’s End friends standing in each part of the paddock…..making sure they knew I was safe. This went on for many more minutes. I just walked, looked, stood…and enjoyed every single moment. Then, the thought occurred to me…CAN I JOG OFF and RUN? No lead pony, no Steve, no Mike Smith…no equipment…JUST ME! I put up my tail and planted my feet in the snow. It felt good. I jogged a bit and felt the brisk air on my skin. I stretched my legs and stepped right out! Hmmm, I thought! This is fun…and it is really going well. I went over to the other edge of the paddock. Donna was there to meet me. WOW!!!! Am I really doing this? I’m all by myself! I pranced to the side of the paddock where all of my other friends were standing. I danced for them…and even walked right over to Dottie and gave her a BIG KISS! I walked back around and greeted every single person as I made my way to the far side of the paddock! SUDDENLY (my confidence now was really strong)…….. I TOOK OFF! I stretched, I bucked, I played…and then I RAN. What a lucky girl! As I rushed across the paddock, I squealed with delight. It was my way of THANKING EVERYONE for my wonderful, wonderful life. What a LUCKY, LUCKY GIRL I AM! After running free for several more minutes, Charles put the shank back on me. As you know, they have to monitor my time like this to be sure I am safe and don’t get too excited at first. The crew then took turns walking me around the paddock some more. Mario took his turn…and it was ALL FABULOUS! After all of this exercise, it was time to go back to my barn and have something to eat. My friends and TEAM Z followed me and stayed and visited with me for hours. What A MOMENT, what A DAY…and what SPECIAL MEMORIES! I hope to share more photos of this day with you soon. Thank you to Barbara for the one we are using today. This day was all very, very special to me…and I know in my heart it was also very special for all of TEAM Z. They traveled thousands of miles to share this one new stage of my life with me! They all told me…they would not have missed today for anything! What more could a GIRL want or have…than so many people who love her SO MUCH! It is so wonderful to see Zenyatta running free and experiencing the feel of the snow under her hooves. Zenyatta looks so happy in her new surroundings. Team Z you are the best! A horse with your ability deserves everything you get, maybe more. I know you are being treated like the royalty you are. Queen Z, Queen of horse racing. You have touched my heart with every post. Being a part of horse racing myself, I know the excellent care race horses get, but you deserve so much more. I hope you continue to keep us up to date on how you are doing and have a wonderful life outside of the racing part of the industry. I am sure you will be gracing us with a wonderful baby to touch us as you have. Hark the Herald Angels Sing ! Such Joy ! Merry Christmas ! oh my all i can say is Thanks to all who made this possible just when I think I cant cry any more happy tears and then this ! Thanks team Z , and Bloodhorse and of course the queen herself! I am so glad you are doing well Mrs. Queen Z! I watched you race at the Breeder’s Cup, and you and I both know you were faster than everyone there! Oh my gosh – what you are all sharing and how you are doing it is incredible. I was so worried when she first moved from CA and these postings are just beautiful, as are you Zenyatta! Thank you so much;I now love reading the updates and the photos/videos really mean alot – no wonder she did so well; surrounded by people like all of you! And the women’s lounge – WOW. You had so much fun Z!! Thanks to everyone there looking out for my No. 1 Zenyatta. I saw the awesome video by Bloodhorse at Lane’s End. Thank you. Love you Z.
Ohh Z how did I miss this post.. One of the best and wow a great pic ..I love Barb Livingston’s work! I feel like i was there in the paddock with you.. this past summer my girl Tara had an abcess in her hoof and had to be stalled for a week.. she was just like you when I let her out for the first time.. and she kicked it up too ! I love it! Love to watch the horses running on their own !! Yee Haa! 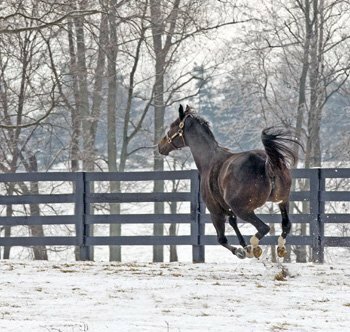 HI Zenyatta, It brings tears of joy to my eyes every time I watch this video of you running free in your paddock for the first time. How very special that Lane’s End allowed the video to be made. And how even more special that the entire Team Z came to Lexington for the event. That is really the most special to see that Mario and Carmen also got to be there with you. Thank you. Thank you all! the champ fly with tale up,so beautiful.Love you my queen!!! !